Come and dance, sing and live a night of madness with the emblematic singers of STARS 80. After 11 years of sold-out touring and more than 3.5 million spectators, Stars 80 are making the headlines at Stade de France once again. On stage, you will see the iconic singers from these tours perform live with their guests, their musicians and their dancers for the MASSIVE MAIN PARTY 80! STARS 80 & FRIENDS Triomphe is a new show, a new concept, the performers open their stage to the next generation... Benny B and Larusso, amongst others, are joining the troupe*. The rumours are rife, Opus, Indeep, Bonnie Tyler and… will be added to the already very long list of singers who will make this evening in Paris, the city of light, one of euphoria and madness. *Sabrina, Jean Luc Lahaye, Larusso, Emile et Images, Julie Pietri, Patrick Hernandez, Joniece Jamison, Plastic Bertrand, Pauline Ester, Début de Soirée, Cookie Dingler, Benny B, Jean Pierre Mader, Patrick Coutin, Phil Barney, Alec Mansion, Laroche Valmont, Jean Schultheis… and their many guests. 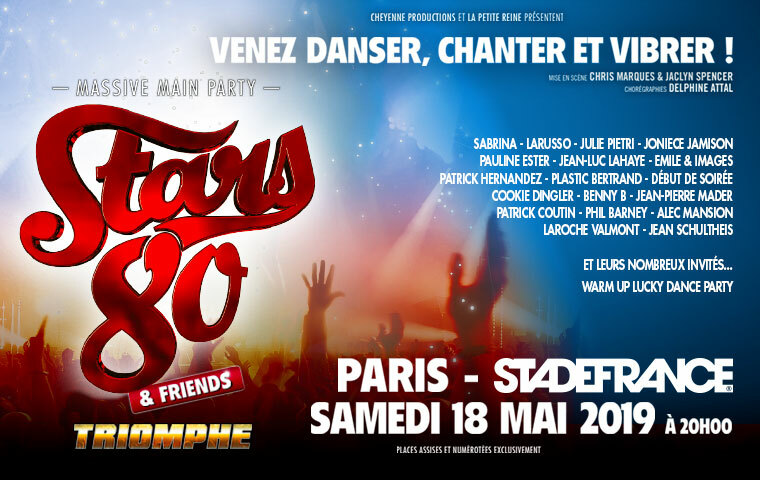 To book tickets for the STARS 80 & FRIENDS concert on Saturday, May 18th 2019 at Stade de France, click on the "Book my seat" button to select the price category of your choice, add a parking space to your cart if necessary and proceed with the payment. 1. How many tickets can I purchase? The limit is set at 6 tickets per order; the tickets are named. 2. And if we want to come to the concert in a larger group? You will need to make another order, without the guarantee that you will all be placed at the same location. 3. What are the Stade de France conditions of entry? To be able to enter the Stade de France arena, you must have your tickets and your identification with you. 4. What is the age restriction? 5. Are cameras are allowed? Professional photographic equipment, cameras and recording devices are strictly prohibited. Pocket cameras and mobile phones are permitted. 6. At what time should we come to Stade de France? Please consult the Stade de France website in order to obtain the opening times for the gates. Please arrive sufficiently in advance to allow you to comfortably enter before the start of the concert. For security reasons, only small backpacks and handbags are allowed. 7. I bought my tickets from an unofficial ticket resale site and I was refused entry. What can I do to obtain a refund? Ask for a refund from the site from which you purchased your ticket. We also recommend that you lodge a complaint against the site. 8. What do you do otherwise to counter the secondary market? “Article 313-6-2.- To sell, offer to sell or expose for sale or transfer or to provide the means for the sale or transfer of entry tickets to a sporting, cultural or commercial event or to a live show, habitually and without the permission of the producer, organiser or owner of the operating rights of this event or show, is punishable by a €15,000 fine. This penalty increases to a fine of €30,000 for repeat offences”. 9. How do I buy tickets for people with disabilities? There, you can obtain information and find out about the process to be followed for the purchase of tickets.